We provide full service for immigration law, handling cases in all areas of immigration and nationality law. Tahmina Watson obtained her law degree and graduated from Brunel University, London, England in 2000. After completing her pupillage (apprenticeship) from Bridewell Chambers in London in 2004, Tahmina continued as a practicing barrister, handling mainly criminal defense matters, before relocating to the United States in 2005. She continues to be affiliated with Temple Court Chambers in London as a Door Tenant. 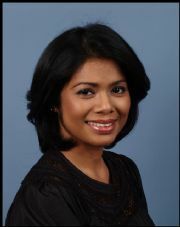 Tahmina was admitted to the New York Bar in 2006. 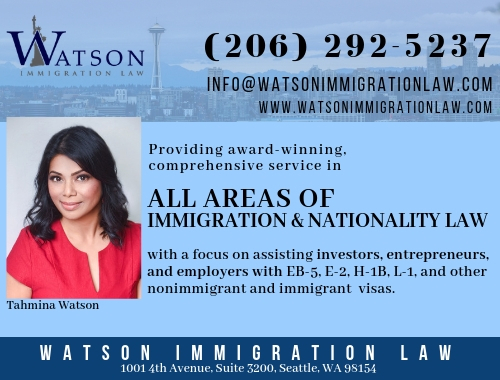 Prior to founding Watson Immigration Law, Tahmina was a partner at White & Watson from July 2006 to December 2008 practicing exclusively in the area of U.S. Immigration and Naturalization law. Before that, Tahmina externed with His Honor Judge Ricardo Martinez at the District Court of Western Washington in downtown Seattle. 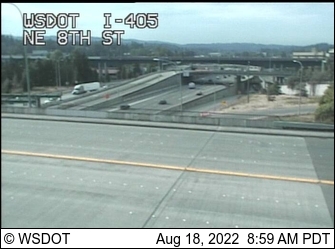 She also interned for multiple terms at the Northwest Womens Law Center (now known as Legal Voice). Tahmina is currently a member of the New York State Bar Association, the Bar in England & Wales, the American Immigration Lawyers Association (AILA), The International Bar Association, The American Bar Association, King County Washington Women Lawyers, Asian Bar Association of Washington and the South Asian Bar Association of Washington. Tahmina is an active member of the pro bono community in Seattle, e.g., Northwest Immigrants Rights Project and the Access to Justice program at Seattle University. Tahmina often provides free legal advice at local legal clinics. Furthermore, she is an active volunteer for Chaya, a Seattle based non-profit organization that assists battered women from a South Asian background. She proudly served as the 2009-2010 President of the King County Washington Women Lawyers (KCWWL). She also served on the board of Washington Women Lawyers from 2008-2010. In the past, she served on the the board of the Asian Bar Association of Washington, and is a current member and volunteer with the South Asian Bar Association of Washington. Tahmina is a member of South Asian cultural groups Jhankar and Pratidhwani. She fluently speaks, reads, writes (and sings when playing her harmonium) Bengali, and knows conversational Hindi and Urdu. In her spare time, Tahmina likes to travel and sew. Dear friends, I just want to share my expirence with watson immigration law. I got my green card in june 2010 so all the info im providing is current. I am not asked or paid by anybody to give reviews its my personal experience with watson immigration law . Tahmina watson is a kind person and great attorney.she helped me through out my case very seriousily .she put all her affords in my case and got me here today i always was allowed to call her personal number whenever i needed and my emails regarding my case were always replyed within or even less than 24 hours . i just met her once all the crosspondence went through phones and emails cause i dont live in seattle. All her staff is very nice and polite .I am impressed how well they take care of their clients. I would suggest anyone who is thinking to hire a immigration attorney to contact Tahmina Watson .